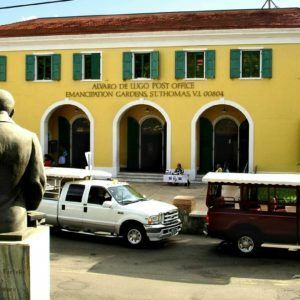 CHARLOTTE AMALIE, St Thomas, USVI - Tommy Ramirez, 29, of the Dominican Republic and Ramon Clavel, 55, of Haiti, plead guilty today April 18, 2018, in District Court before District Court Judge Curtis V. Gomez, to possession of cocaine with the intent to distribute, United States Attorney, Gretchen C.F. Shappert announced. According to court documents, on February 12, 2018, Ramirez instructed Clavel to present himself at the Emancipation Gardens post office to claim a package that contained a white powdery substance. The white powdery substance was sent to the Drug Enforcement Administration (DEA) laboratory and testing confirmed to be one kilogram of cocaine, a controlled substance. Ramirez and Clavel face a minimum sentence of five years and a fine of $250,000.00. Sentencing is scheduled for August 23, 2018. The Drug Enforcement Administration (DEA), the United States Postal Inspection Services (USPIS), and the Department of Homeland Security Investigations U.S. Customs and Border Protection (CBP), and the Federal Bureau of Investigations (FBI) investigated the case. The case was prosecuted by Assistant U.S. Attorney Sigrid M. Tejo-Sprotte. Nothing's happened yet, so it's a bit premature to spike the ball.